The Centre of Australia remained the great unknown to the Australian Colonists. These European settlers had not been able to penetrate the interior. Many explorers had tried, among them Eyre, Sturt and Tolmer from the south and Gregory from the north. But their horses could not travel more than two days without water. They were blocked by the deserts in the centre and the salt lakes from South Australia. Fifty years after settlement no white man had yet been able to set foot in central Australia. Aboriginal people lived a nomadic lifestyle throughout the land. Populations were larger in the higher rainfall areas of the Top End where fish and game were plentiful and there was little need to go far for food. Around Central Australia and further south in the arid desert regions, groups were scattered over huge territories. Survival in these harsh environments depended on waterholes and seasonal bush tucker. Desert people needed great skill and knowledge of the land's often meagre resources. Permanent waterholes were a focus for people and animals, especially during severe droughts. The women, accompanied by children, provided the bulk of the staple diet. They collected seeds for grinding into flour, also fruits, bulbs, roots and small animals. Honey ants and plump witchety grubs were a favourite. All food was taken back to the camp and shared. The men hunted larger animals. Aboriginal culture is enshrined within complex laws of social, family and religious life and has been passed on, generation to generation in ceremonies, song and dance. For years there was great speculation of what might lie in the centre of the continent. The land was gradually being surveyed and mapped but the centre kept its secrets to all but the Aboriginal people. Many explorers tried, but were driven back by the harsh, unforgiving conditions. In 1841 Edward John Eyre led a party from Adelaide and explored through the Flinders Ranges but was blocked by the salt lakes and lack of water. Captain Sturt had a burning desire to reach central Australia and in 1844 led an expedition from Adelaide. They took a small boat to sail on the inland sea and followed the Murray River, headed north-east and then passed where Broken Hill is now. The party remained at a waterhole for nine months after surrounding waterholes had dried up. The boat was left to rot at Depot Glen. From the north Ludwig Leichhardt crossed from Queensland to Port Essington, the most northerly settlement. Later in attempting an east/west crossing his party of eight men, thirteen mules, twelve horses , fifty bullocks and two hundred and seventy goats disappeared without trace. From the Colony of South Australia, Babbage, Warburton, Hack and others were exploring and opening up country for settlement. In 1858 AC Gregory explored south from the source of the Victoria River in the Northern Territory until grassy plains gave way to salt lakes and desert. An entrance through the salt lakes was found. Stuart led a small party from the south and surprised everyone when they got as far as where Coober Pedy is now. In 1861 Victorian Robert O;Hara Burke with William Wills as surveyor led an espedition north, They were farwelled from Melbourne by a crowd of ten thousand. The gold rich Victorian government has spared no cost with twenty seven camels especially imported as well as horses, carts and provisions for seventeen men for eighteen months. In 1861 Stuatt ed an expedition of men with horses and packhorses and set out in the heat of January. Eleven side trips Stuart persisted with, but could not find enough water to take the party further north to the tropics. They turned back thinking that the Burke and Wills party would have succeeded. The Burke and Wills party had divided with most of the men remaining at lakes and a small party pushing north. It was a tradgedy of errors with the main party leaving just hours before the exploration party returned to the lakes. Seven men died including Burke and Wills. 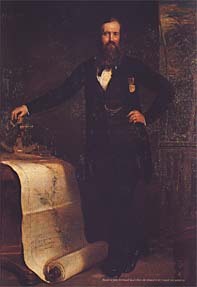 The day after he returned, Stuart met with Governor MacDonnell to organise a new expedition. There was news that the under-sea cable was progressing and would link Australia with communication with the rest of the world. An expedition of ten men and seventy-one horses was organised. It was perilous isolated country they were about to attempt. They would be far from help if there was any trouble. Follow Stuart's journey, contending desolation, lack of water, poisonous weeds, flooded rivers and fire. All the time Stuart spent away from camp with only dried meat and flour for damper affected Stuart's health. He developed scurvy and nearly died. McGorrey, the blacksmith made an ambulance strung between two horses and Stuart was carried more than 400 miles by this. Stuart's meticulous four page map is included in the Exploring The Stuart Highway book available in the Buy the Book section.